The EinScan-Pro is your best choice for capturing real world data to convert into a digital 3D model. It can be used for applications in manufacturing, engineering, design, development, testing, artwork archival, animation and even human form acquisition. The EinScan-Pro 3D scanner allows you to use physical objects to better conceptualize an idea or create a starting point for modeling in CAD (Computer Aided Design). 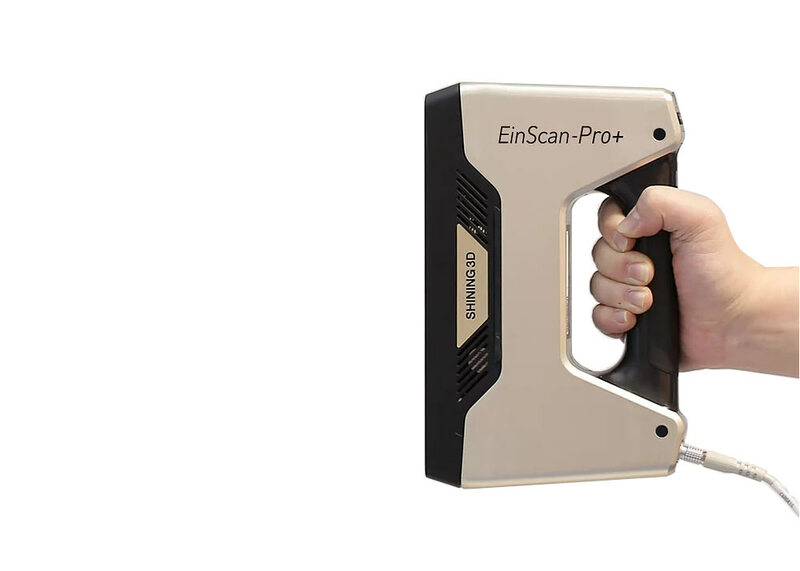 The EinScan-Pro can capture textured and colored objects ranging in size from 0.03m up to 4 meters. Automatic- single scan takes less than 2 seconds. Does it scan shiny surfaces? The scanner struggles with shiny surfaces, we recommend coating any shiny surfaces with a matte waterbased paint, or coat it in talcum powder, although this can affect the surface of the scan. Can it scan a person? Can I use the scanner? Yes, with a proper 3D scanning induction you can be trained up to use the scanner. Please check out our 3D scanning workshop below. Can I 3d Print from a scan? Yes, the scanner output files in an STL file format which is perfect for 3D printing.